Will you need to move in with your children someday for care? Have you talked to them about this? 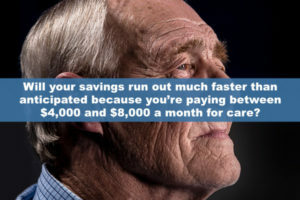 Will your savings run out much faster than anticipated because you’re paying between $4,000 and $8,000 a month for care? And, this amount is what home care or assisted living facility care costs and is not enough to pay for a nursing home. Have you considered addressing this but just keep putting it off? It does not get better or less expensive by waiting. When I was 49, I purchased long-term care (LTC) insurance. I was active, healthy, and better lzooking than I am now that I am pushing 70. Why? I decided I did not want to worry about LTC when I retire. I wanted to get this out of the way so I could spend my money on travel and fun things. I did not want to be in the position of being afraid to spend because I might need that money for care some day. It took some discipline to make that annual payment back then. In retrospect, it cost a lot less than premiums would be now had I waited. Besides, with the arthritis and diabetes I now have, it would be unlikely that I would be able to buy the insurance now. Have you thought about being a burden to your adult children? Many years ago, women did not work outside the home and could care for parents. How many of your adult children in their prime earning years can afford to retire early or work part time so they can care for you? I recently visited a friend my age in an assisted living facility. He never expected to be in such care at this age. He had planned on golfing, hunting, and traveling at this point in his life. We discussed the cost, and he knows exactly how long it will be before his savings run out as he dips in each month to make up the shortfall of his income. Each year, fewer and fewer assisted living facilities accept Medicaid. Medicaid is a welfare program that will pay for LTC once you are completely impoverished (that is, you have less than $2000 to your name). Medicaid pays facilities only a fraction of what it costs to provide care, so they can’t remain viable if they accept Medicaid payment for residents. Can you lose money on every customer and make it up in volume? Of course not! Thus, you may get in, as long as you sign a document agreeing to being evicted when your money runs out. On the other hand, nursing homes must accept Medicaid because they are required to if they accept Medicare payments for their rehabilitation care. Assisted living facilities do not provide services that Medicare reimburses, so they can deny services to Medicaid beneficiaries; more and more are doing so each year. So, who will care for you when your health changes? The federal Department of Health and Human Services says that by the time we reach age 65, 70% of us will need care. Do you think you’ll be in the 30% who doesn’t? Okay, now for some good news. Many people assume the insurance that pays for LTC is too expensive. That is because they do not realize most people need less of it than they initially suspect. When care is needed, your life style will change considerably. How many vehicles will be in the household when only one of you can drive? You won’t be able to take trips to Branson, go on cruises, or enjoy Door County weekends. There will be no more golfing, snowmobiling, motorcycling, fishing or camping trips. Even going out for dinner may be too complicated, because it will be difficult to get in and out of the restaurant and use its bathroom. When these lifestyle changes are taken into consideration, many people find they can contribute a portion of their income towards the costs of care. In addition, the interest or yield from investments can be used without needing to tap the principal. Together, these sources may cover half or more of the care costs, leaving only a small portion of the cost you need to cover with LTC insurance. When you need smaller amounts of insurance than anticipated AND you apply when you are younger and have a good medical history means that you can have premiums much less than many expect. If you investigate with someone knowledgeable in how care is used, local costs of care, and how to choose appropriate coverage, you may find this can eliminate becoming part of the 72% of retirees who worry about this. How long do you want to kick this can down the road before you investigate this for yourself? Romeo Raabe, LUTCF, LTCP can be reached at www.TheLongTermCareGuy.com or by calling (920) 884-3030. For over 25 years he has helped people find solutions for nearly any health or financial situation concerning LTC.